Home Angel and Rocky Angel Locsin Angel Locsin and Rocky Batara Celebrity Celebrity Moments Celebrity Photos movie movie date Photos with the Stars PIctures with the Stars Unofficially Yours Valentines A Valentines with Rocky and Angel Locsin! 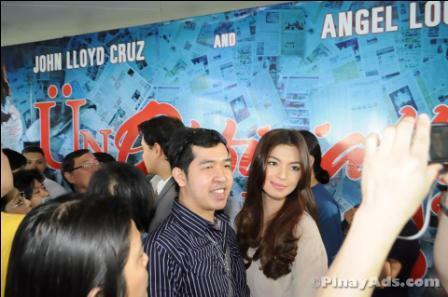 Last year, I spent my Valentines with the country's sexiest and hottest actress Ms. Angel Locsin. And that was inline with their romantic movie, "Unofficially Yours." It was exactly one year ago! And that was also my very first time to meet, mingle, and talk with my favorite actress. Our first meeting turnout to be my most memorable event since it was my first time to see Angel in person. And this meetup proved that Angel is truly beautiful not only outside but more inside. Yes, she is truly nice and kind! She is very approachable and easy to deal with! "Talagang siya pa ang lalapit at babati sa'yo!" Falling in love with her is truly irresistible! Aside from our lunch photos above, below are my other photos with Angel Locsin during the grand presscon of "Unofficially Yours:"
I was also supposed to see Angel in the 2012 Yahoo OMG Awards Night in SM Mall of Asia Arena but was not prosper because Angel wasn't able to attend due to "One More Try" filming in Baguio. The box-office hit "Unofficially Yours" starring Angel Locsin and John Lloyd Cruz was Star Cinema's 2012 Valentines movie offering. And I watched it together with my ex. This year, the Star Cinema's Valentines movie is "A Moment in Time" starring Julia Montes and Coco Martin.